What is Alondra Hot Wings? 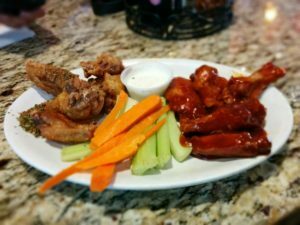 Alondra Hot Wings is a franchise restaurant that’s all about chicken wings and different hot wing flavors. It’s also all about…the mob? Or something like that. I don’t know, but they have a bunch of decorative newspaper photos up of historical (I assume) mobsters who have been caught and arrested. It’s kind of confusing. I have mixed feelings about whether I like it or not. Again, I was confused. Walking in, I was thinking, “Are y’all about hot wings, or are y’all about criminals?” I guess both? Anyway, my friend J and I walked in and were ignored for a few minutes by the lady up front who was on the phone with what I assume was a call-in customer. No biggie I guess, except there was also another party waiting ahead of us with exacerbated expressions, so I bet they had been ignored for quite some time too. If that was the case, then biggie. Not very cool. • Cajun & Honey BBQ Hot Wings (pictured above): The chicken meat itself wasn’t bad. I thought it quite flavorful and juicy. The Cajun wings were very subpar and a bit too dry for my taste. They didn’t taste very cajun-y or spice-y at all. I liked the Honey BBQ wings much much more–they were juicy, tangy, and very delectable. • Garlic Fries: Very very flavorful. 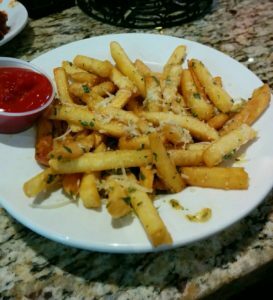 If you like garlic and cheese, definitely try this. Overall, it was way too oily though. It was as if the dish were marinated in butter for a while before being served. I think I’m sweating it all out as I type this, in fact. To put it bluntly: meh. This place is worth a try, but not worth the return. Class 302 is way better. Alondra Hot Wings is alright. They have a huge variety of hot wing flavors to choose from, which is fun, but overall the food does not blow the mind. If you've tried Alondra Hot Wing, submit your review below! you’re really a good webmaster. The web site loading speed is incredible. It seems that you’re doing any unique trick. Furthermore, The contents are masterpiece. you’ve done a excellent job on this topic! Previous story L-Theanine and Caffeine: Wake Up Your Brain!